Let's work through anti and syn additions to alkenes. 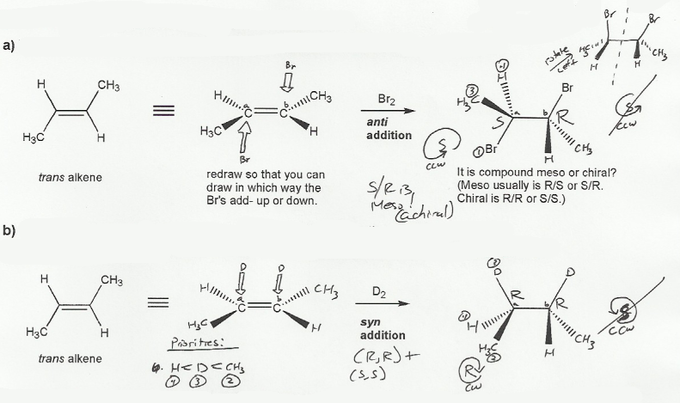 Show the product for each reaction below, and indicate whether the product will be a racemic mixture of enantiomers, or a meso compound (which is achiral). 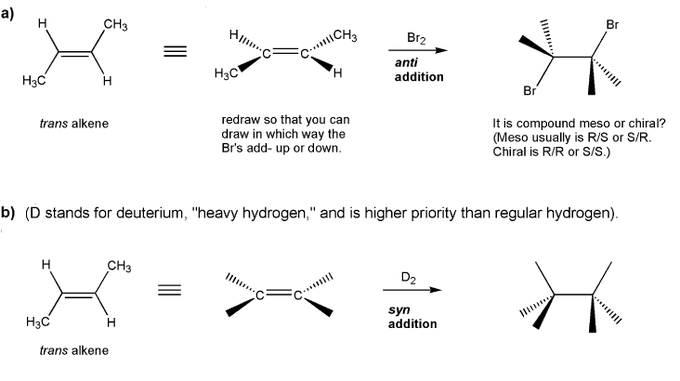 The reaciton of an alkene with Br2 is an anti-addition, and hydrogenation (H2 or D2) is a syn addition. From this we can figure our the relative stereochemistry of each product. Each starting material is achiral, and therefore not optically active, so the products cannot be optically active. In both a) and b) each product has a sterocenter, so the products can't be achiral. In a), one stereocenter is S and the other stereocenter is R, and both with the same substituents, so this is a mirror image relationship, and the products are meso. In b), the products have no internal mirror planes, so the products are chiral, and must be a racemic mixture. MendelSet practice problem # 530 submitted by Matt on July 2, 2011.